I chatting the other day with Chris Canal, who played with reimplementing piece of code Jimmy Bogard put on his blog using Castle Windsor. While I’m not an ASP.NET MVC expert by no means, I decided to give it a go and try to do it myself. See Jimmy’s post first to get the context, as I’m only going to talk about the code. Jimmy used child container to scope the contextual dependencies. While this is also possible using Windsor, it feels like using shotgun to kill a fly. We can use contextual meta-components that will have the sole purpose of scoping our RequestContext and ControllerContext and achieve the same effect as if we were using child container, only this is far more lightweight. Having that we can now simply use the hosts to cache their respective components. We set the RequestContext in ControllerFactory. ControllerContext has a twist. Since we register controllers as transient, we have to pass the controller to ControllerContextHost right after it gets created. We use OnCreate method for that. Both hosts are registered as per web request since that’s how we want to cache the contexts they host. We’re only going to use the hosts internally and not expose them. Hence we register the contexts via UsingFactoryMethod. We also don’t register the ControllerContext directly, but rather via Func delegate, to break cyclic dependency between ControllerContext and Controller. And now, assuming I didn’t mis-translate Jimmy’s StructureMap code, out application should work just like his sample. Castle Windsor allows you to use single component for multiple services, which is called Forwarded Types. 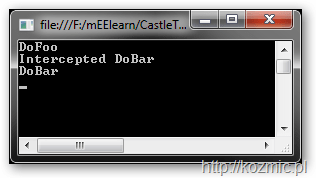 In other words, you can tell Windsor – when IFoo is requested use FooBar as implementation, and when Bar is requested also use FooBar (when using default lifestyle of singleton you’ll get the same instance). What if you want to use proxies for that component though? Notice that DoFoo is non-virtual. In this case, here’s what we’re gonna get. DoFoo did not get intercepted. So what’s the issue here, and how do we fix it? When you forward a registration, Windsor runs just the first type through the complete registration pipeline, and subsequent forwarded types are treated just as additional piece of data “Oh, by the way, use this component I just registered for this type as well”. Proxy registration is a part of the component model building, and since we end up having just one component only information about its main type gets recorded for proxying. While this might appear at first clearly as a bug, I think it’s rather a by-design feature. Forcing Windsor to figure it out by itself could pretty quickly become very tricky and we might not always get what we expected. There are however ways of getting what we want. Now that we know what we’re up against, how do we fix it? First and the most trivial fix would be simply to make the DoFoo virtual – this way it would get picked when proxying Bar base class and we could successfully proxy it. While this may not always be applicable (you may not be able to modify the class) this is the only option that is available if you’re using the released version. However if you’re using trunk there are two more possible ways of bending it to our will. This is not a solution most people would choose anyway. Even if you can do it (your service does not come from a 3rd party library), you’re decorating your service class with a Windsor-specific attribute which many consider an anti-pattern. There’s however a third, more pure way. Windsor will implement the interface, but it will treat it as interface proxy without target. You can make it work by inserting a dedicated interceptor that will forward the calls to your class, but it’s something you’ll have to do manually all the way through. I said that forwarded types don’t get ran through whole registration pipeline. However, kernel does raise its component lifecycle events for them, so we can hook up to them and get notified when our forwarding handler gets registered, and modify its component model. We start by hooking up to kernels HandlerRegistered event, before we register any components. In the OnHandlerRegistered method we check whether the handler at hand is a ForwardingHandler and if so we add its interface to the list of additional interfaces we want to proxy, just like we did using attribute in the example above. Now we get our interface proxied without having to touch our component’ code. There does not seem to be too much details on how to set up a test environment for NHibernate testing using SQLite. Ayende has a nice post on this, but he does not go into details of how, what and where, so I decided to fill in the blanks, and provide an up to date sample for NHibernate 2.1. 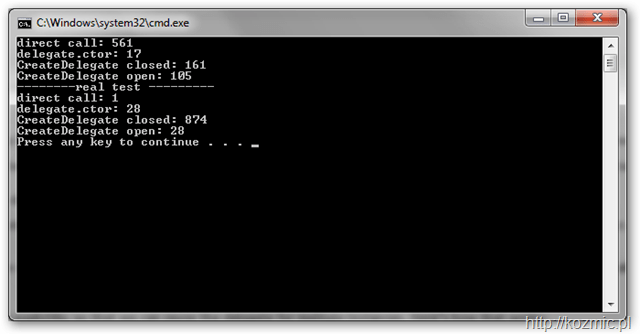 SQLite itself scroll down to Precompiled Binaries For Windows and grab the sqlitedll version. Now we need to add references to all these projects. Make sure you add correct reference to System.Data.SQLite (either x86 version from the main directory, or x64 version from x64 folder if you’re running on 64bits). I expose the SessionFactory, not Session. That’s because I use this class for testing repositories in stateful application, that manage the session themselves. I save the database to file, instead of keeping it in memory like Ayende does. That’s connected to the previous fact. Apparently, in-memory database only lives as long as session that created it, which does not cut it for me. Pretty simple and so far, covers my needs. 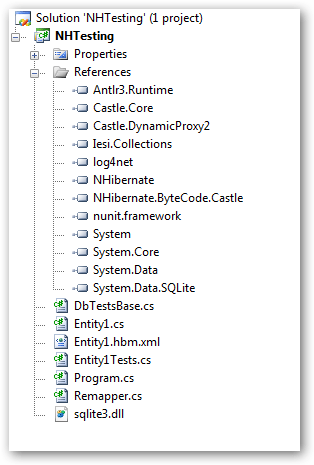 All .NET delegates inherit (indirectly) from System.Delegate class (and directly from System.MulticastDelegate) which has a static CreateDelegate method. The method has two powerful characteristics that are not widely known. All methods are runtime managed, meaning that, in a similar fashion you provide implementation for interface methods, runtime provides implementation for delegate methods. Take a look at the constructor. Regardless of delegate type it always has two arguments: object (on which a method will be invoked via the delegate) and a handle to that method. Kenneth suggested another approach – using Delegate.CreateDelegate, because as it turns out, you can successfully use that method to bind delegates to private methods. That is the first important characteristic that may be a life saver in certain cases. It has a drawback though – it’s order of magnitude slower than creating the delegate via its constructor. Solution brings us to the second characteristic I wanted to talk about – open instance methods. If the signature of type explicitly includes the hidden first parameter of method, the delegate is said to represent an open instance method. When the delegate is invoked, the first argument in the argument list is passed to the hidden instance parameter of method. If the signatures of method and type match (that is, all parameter types are compatible), then the delegate is said to be closed over a null reference. Invoking the delegate is like calling an instance method on a null instance, which is not a particularly useful thing to do. With this approach we pay the price of delegate creation only once per lifetime of the type. I was curious how all these approaches would perform, so I created a quick poor-man’s benchmark. via delegate created using CreateDelegate passing first argument explicitly (not null). via delegate created once using CreateDelegate and then reusing it for subsequent calls. As you can see, when reusing the instance after 100 calls we can achieve the same performance as when using the delegate’s constructor, which, given we can use in broader spectrum of cases, is pretty amazing. If you want to run the tests for yourself, the code is here. Not that I’m proud of that, but to circumvent the limitations of CLR and C# I sometimes had to use reflection, code generation, changing behavior depending on who’s calling etc. However I think this code beats all that. /* Since we need RuntimeMethodHandles and the struct does not have a constructor we can use, we need some other way of obtaining these. * We're stealing them from mscorlib. We can (hopefully) do this, because it's only for AsyncType's Begin/End methods. * as keys in the dicionary so we only need to have different ones, and we should be fine. It’s a part of my effort to enable asyncronous calls on WCF proxies created via ChannelFactory. You can see the whole code here. I’ve been working with NHibernate for the last couple of days, and as I make my way though it, I find out about things, that were not so obvious to me at first, so I decided to post them here, so that someone else can benefit as well. First thing you learn about NHibernate (well ok – first thing I learned about NHibernate, but most of you probably as well) is that it requires you to mark your properties virtual, have parameterless constructor, and pay special attention to your GetHashCode() and Equals() methods. This gets the job done, but it’s far from being persistence ignorant. You usually don’t want to expose a setter for your collections, so that they can be swapped. Also the set accessor on HasPets property is nothing short of an ugly hack. 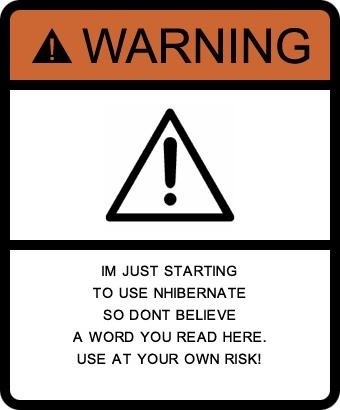 Although we have no explicit sign of NHibernate in the code, it is anything but persistence ignorant. You can however make it so. Now it looks like a “normal” class. Will it work with NHibernate now though? – Absolutely*. The trick is to use mapping files appropriately. What’s changed? I added the access attributes to the mappings. 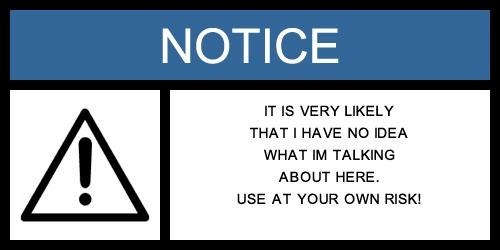 For HasPets I set it to readonly. That way NHibernate will read the property and use its value when doing INSERTs and UPDATEs, but will not include it in SELECTs. For Pets one-to-many mapping I used value that tells NHibernate to use the getter to read the value of the property, and to write to the field directly, and that field name is _pets (by convention). There are quite a few more options, and you can use them to do some pretty powerful things, like enforcing consistency in two-way *-to-many mappings. As a follow up to my previous post, here’s the simplified – Console based version of the code. This is a solution. Not the best one, not recommended by anyone, just the one that happened to solve my problem. So take it with a (big) grain of salt, and if you know a better one, use the Leave your comment function below. The thing to note is, that the Export with the key “View” and of type IShellView is not provided directly by any type implementing the interface. Instead it its exported by the presenter, as a field that gets set by MEF via constructor. That way, when the Shell needs the “View” MEF sees that it needs to create a Presenter for that, and in order to create presenter it needs to use the ImportingConstructor, and provide it with IMyView and IModel. Since the type implementing the IView is IMyView it gets injected into the Presenter. Also, since it implements IShellView as well, it satisfies the needs of Shell and gets injected into it. Pretty sweet, and no code was required to achieve this (except for some Attribute magic).